ELIZIBETH CITY, NC – This past year, Dodge has done a phenomenal job with completely rebranding and promoting its muscle machine, the Dodge Challenger Hellcat. Dodge deserves tons of credit for building the now iconic 6.2 liter HEMI V-8 Hellcat engine currently powering the Challenger SRT Hellcat and the Charger SRT Hellcat, but it also deserves the credit for giving the engine such a unique, and honestly AWESOME, name. 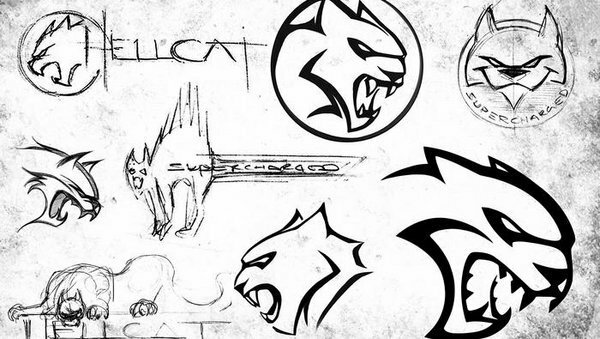 The evolution of the Hellcat logo is definitely interesting. The first Dodge Challenger SRT Hellcat did not have the now-familiar feline logo that graced the vehicle last May. Originally the Hellcat vehicles were just supposed to have the “supercharged” Dodge badging, said Dodge CEO Tim Kuniskis in a recent interview with Automotive News. But Dodge did something that more auto companies should do, they closely monitored the public’s reaction to the Hellcat logo on social media and eventually chose to add the logo to its production cars after hearing the fan base’s feedback. The change was so last minute, adds Kuniskis, that the cars used for the Challenger Hellcat press unveiling didn’t even have it initially. Just like the Challengers and Chargers themselves, the Hellcat logo had to go through a rigorous design process that involved tons of rough drafts and sketches. Early sketches show everything from an “angry housecat” to something commonly refused with the Voltron logo. Dodge however, choose the right one, and the rest we can say….is history! With the evolution of the Hellcat logo, the Dodge Challenger SRT Hellcat and the Dodge Charger SLT Hellcat logos will go down in muscle car glory along with the Cobras, Road Runners, ‘Cudas and Mustangs. If you would like more information on the now iconic muscle car, give us a call! Perry Auto Group has two dealership locations to serve you better at 1005 W. Ehringhaus St, Elizabeth City, NC, 27909 or 1001 Halstead Blvd Elizabeth City, NC 27909. Feel free to call us with any questions at (252) 338-9100.